The announcer, who is a part of the morning show in The Beat 92.5 FM, is looking for a girl. And he is serious, even when his method may seem unconventional. 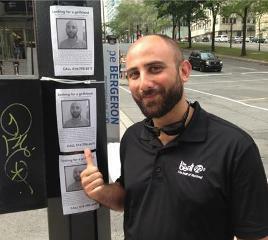 Straight from the radio, Sam Lupovich took a photo of him and had the crew of the station post flyers in Tuesday morning all over Montreal downtown soliciting single girls to go a date. On the flyer, he described himself as employed, outgoing, fun, and very handsome. The 31 years old guy has been a part of The Breakfast on Beat with Sarah and Cat since he came back to his native town last autumn, after spending ten years in Toronto. He said he’s tried dating websites, some people at work, and setups from friends also have tried to arrange him dates, but still he has not found the proper person. The producer of the Beat Breakfast, Paul Awad, has been fielding calls, and said that 10 persons had expressed interest according to Tuesday afternoon. Some were disqualified because they’re from outside the country and wanted just to gain Canadian citizenship quickly. Over the next days, the hosts of show, Sarah Bartok and Cat Spencer, will help Lupovich make a decision which of that candidates are worthy to go on a date, and listeners also will have a say. Lupovich has also promised to give some details as for the date on the air, and provide some updates.